The eyes are just two ovals cut from a sheet of black felt, and the whiskers are 6 thin rectangles cut from the same black felt. Attach the legs to the bottom of the body, where the blue is. You do not necessarily have to stitch them on how I did, which makes the Hello Kitty stand upright. You can also stitch them on so that she is sitting down. It’s up to you. Attach the arms to the side of the body in whatever position you want. Attach the ears to the head, and make sure not to set them too close together because Hello Kitty’s ears are quite far apart. Attach the nose to the lower center of the head. Notice that Hello Kitty’s nose is right above her chin, which gives her a lot of her cute character, so the placement of her few facial features is crucial. Attaching the whiskers and eyes is simple, but be sure to refernce the above picture. Notice the eyes are wide set apart. The whiskers aren’t too long and are a even distance from each other. I used a glue gun, but you can stitch them on if you like. Attaching the head to the body is also simple, just use the tail left on the body, to stitch it to the head tightly. Attaching the suspenders with a glue gun is a simple and sure method. I glued one tip of each suspender to the front of Hello Kitty’s pants (where the blue yarn ends and the yellow begins) and criss-crossed them in the back and glue those tips to the edge of Hello Kitty’s pants. Once again, you are free to stitch them on, I just tend to get lazy because I want to post the pattern so quickly. I am a little confused on the directions for this pattern. 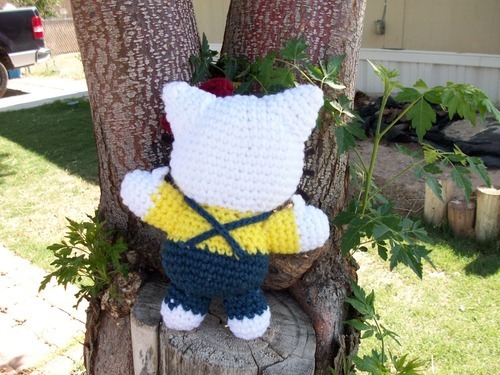 I really want to make this kitty! 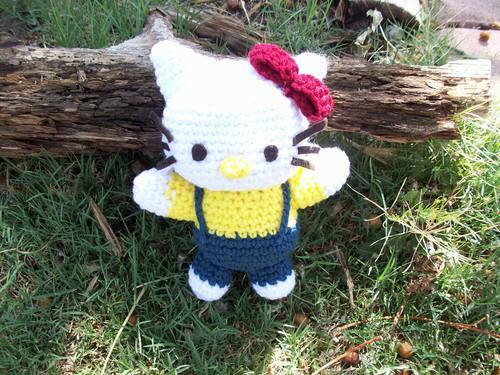 My roommate is OBSESSED with hello kitty and I think it would be awesome to make this for her! I guess my confusion starts when you say around (#). So like with the head: single crochet in nxt st, 2 single crochet in nxt st, around (18). What does that mean?? So altogether you should have 18 stiches, or it’s from those stiches you just made, around 18? I’m so confused. When I say around, I mean to repeat the instructions given for that row all the way around. so once you get to round 3 you will sc in next st, 2 sc in next st and repeat that around until you've reached the last of the 12 stitches. When you've finished the 3rd row row you will be left with 18 stitches because you increased a total of 6 times, so you have 6 more stitches than the previous row. hope that helps and sorry for the wait! I’m sorry, this is the only Hello Kitty pattern I’ve made. 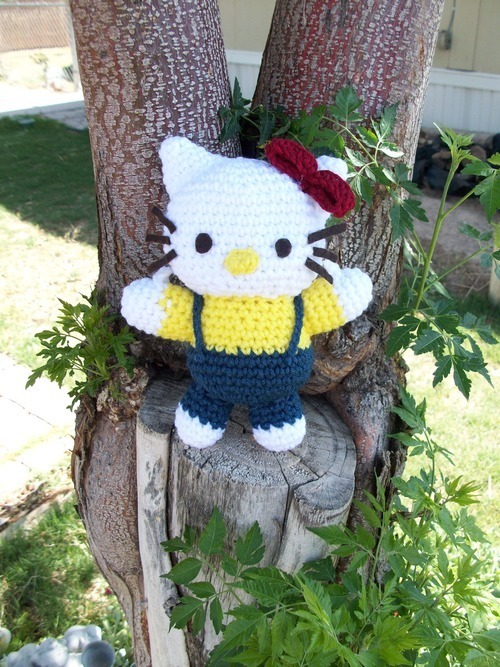 Have you tried searching for other Hello Kitty patterns on Ravelry? This doll is so cute! 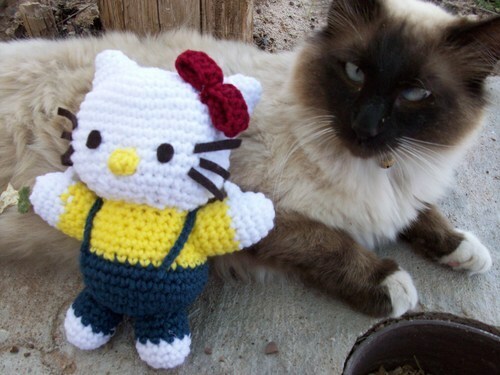 I want to make one for my friend, who loves Hello Kitty. But do you know how I can make her wear a dress instead of a shirt and pants?? then just stitch it on to your liking. Oh and if you want her dress to look more like a tank top without the sleeves, just complete the Hand/Arms section all in white, do not switch colors at all. Thank you so much!! That definitely makes sense. I’ll try it! can u please tell me if wool is DK or 4 ply? It’s really up to you what type of yarn you use. I typically use 4 ply. Awesome pattern, I’m half way through making the head now 😀 Just a quick question though….how did you make the bow? There is a short section in the pattern that tells how to make the bow. so after completing the row of hdc’s, you sew the ends together. Flatten the piece so that there are two “layers” then use a separate piece of yarn to tie a knot around the center and create the bow. Hi! I was trying to make one, but it seems that I made something wrong. I believe that the problem is slip stitch. English isn’t my first language so I don’t always understand everything right. I’ve tried to search everywhere but I can’t find explanation anywhere. Could you explain to me how do you “make” a slip stitch? When you put the hook through the loops of the next stitch, yarn over and draw the yarn both through the stitch and the loop already on your hook. Does that help? If not, check out YouTube for a visual explanation. I love this pattern and a lot of my co-workers love it to.